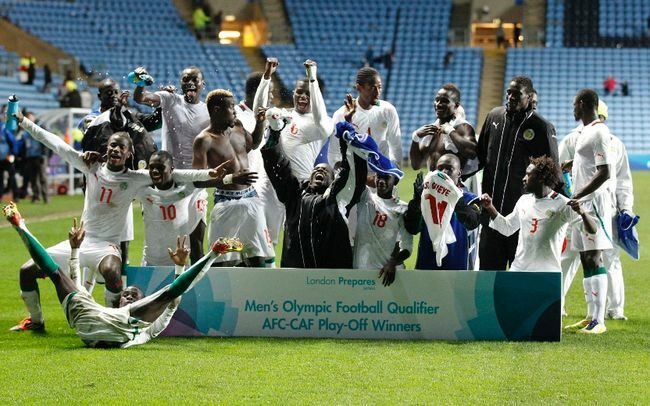 Senegal celebrating after Olympic play-off win over Oman. The superabundance of strikers and defenders at the Teranga Lions’ disposal had many salivating and fancying the West Africans' chances before the 2012 Africa Cup of Nations. The salivating proved to be premature and sour as the strikeforce was too top-heavy, a midfield bereft of ideas created no chances for the strikers and the defence looked cumbersome and incongruous with the high line they played. Naturally, then, the focus for Senegal for the Olympics appears to be diligence. The rhetoric from the management team, which includes Senegal World Cup 2002 captain Aliou Cisse as the Assistant Coach, seems to have vivid awareness of the complacency of the full national team at the Cup of Nations and in the yesteryears (years of wilderness since threatening to become the first African side to reach the semi-finals of the World Cup at the 2002 World Cup). "The most important thing that has to be 100 per cent if we want to have success at the Olympics is mental strength and the ability to keep focused," said Cisse. Preparations for the Olympics have been far from ideal, however, with European clubs unwilling to release their stars for the global centrepiece, meaning the team that finished fourth at the CAF U-23 Championships last year has changed significantly. Despite the disruptions, they have managed to beat favourites Spain 2-0 and Switzerland 1-0 in their pre-tournament friendlies. Senegal coach Karim Sega Diouf deploys the fashionable 4-2-3-1 system and look to get the ball to the wings as often as possible for swift attacks. Collectively, they are physically very impressive and imposing – with all of the squad over 185 cm; the core of the team is difficult to break down with the defensive pairing of Abdoulaye Ba and Papa Gueye, and likely midfield pivot of Mohamed Diame and Idrissa Gueye. Unconventionally, that aforementioned spine of the team are technically accomplished despite their gruesome features, although there are question marks over how well they will function as a unit. With Alan Pardew reluctant to let the Dembas out to play, Dame N’Doye has been added to the Senegal strikeforce to give them some much-needed oomph. The Copenhagen striker has been a prolific scorer in the Danish league – finishing as top scorer for two successive seasons – and is no stranger to the lone striker system. Whether enough chances will be created for him to flourish remains to be seen. The lofty Abdoulaye Ba is the lynchpin of Senegal’s defence and, height aside, instantly stands out with his penchant for headed clearances. The Porto centre-back, who was on loan at Academica last season, combines effortless long-range passing and brute-like strength with right-place-right-time interceptions. The lack of goals throughout the team may be a problem, with Senegal only scoring 3 goals in 5 games during the CAF U-23 Championship last year. In Idrissa Gueye and Mohamed Diame they have two very industrious midfielders who offer terrific military tank-like drive from deep in midfield, but, whilst they are technically adept, they ultimately lack the guile and patience to control games. With the hosts Great Britain and the much-fancied and well-drilled Uruguay in the group, the odds are against Senegal. What they do have in their armoury is sheer athleticism – or an overload of over-aged players, if you’re a cynic – an attribute which has seen African teams triumph at the Olympics. Their ability to impose themselves on the opposition was certainly a key feature in their friendly wins over Spain and Switzerland, and with confidence sky-high they may surprise a few people.